How many times have you looked at your closet at thought 'I have nothing to wear' even if it is full of clothes? If you're like me, then you've probably thought so a million times. The key is to own items that make you feel good about yourself. So toss everything you haven't worn for a year because you probably never will wear it again. At the same time also learn to edit your shopping by visualizing a look or an item that you need or will work with your wardrobe/lifestyle. tops in neutral colors - It could be a shirt, a tee or a tank. These can be layered, dressed up and down depending on the season and where you're going. And you can pair them with on trend bottoms or accessories. little (Any color) dress - I do not believe in the little black dress being a staple. Why? Frankly, because the whole world patronizes little black dresses. Whether its vintage, thrifted, high street or designer a LBD will look like any other LBD. So I suggest you to experiment with other colors like white, gray, brown, blue or even yellow or red if you're bold! bags - Something that matches with a lot of our outfits and shoes and is comfortable to carry around. shoes - Shoes can make or break an outfit. Make sure you buy shoes that are beautiful but comfortable. I have bought lots of gorgeous shoes that were either uncomfortable or eventually ripped at the seams because of a bad fit because I have giant feet. well fitting pants - I do not believe in jeans as a staple either because I personally do not find them very appealing. Sure, they are great for a casual look and I guess 80% of the world's population swears by them but I personally love corduroys! Also, if you look around, most fashionable people usually center a look around pants which are not jeans. A good tailor is like a good pair of shoes - necessary, worth every penny and capable of making you look 10 pounds thinner. If you have a perfect body, every thing will look good on you. But honestly, we all have different bodies and not every garment we purchase will give us the most flattering fit. But a little tweaking here and there can make your outfit fabulous, all thanks to the tailor. I find a tailor in every city I live in who gets used to seeing my face at least once a month. I actually have a friend who teases me for my 'dates' with the tailor. Miniskirts and skinny jeans will betray you in a heart beat once you put on 5 pounds. But your accessories - shoes, scarves, necklaces, bags - will stand by your side through thick and thin. They will instantly transform a blah outfit for you and update your wardrobe without spending lots of money. Stylish women know how to cosy up to one accessory. Jackie O and her sunglasses, Audrey Hepburn and her scarf. Just make sure you don't go overboard. A Louis Vuitton bag paired with a Burberry scarf and a Moschino Belt will just make you look like a label whore. Style is all about unusual combinations. If you mix the casual with the elegant, the soft with the hard, the glamorous with the comfortable, it will always produce chic results. It's what will make you look different and interesting, which is the hallmark of a stylish woman. You don't always need high fashion expensive labels to look good. Like I said before shoes can make or break an outfit. A great pair of heels is a powerful thing - it can change your mood, your posture ; it can make a boring outfit fabulous in an instant and it always makes you look taller and thinner. You can never have enough high heels. If people tell you differently, smile politely and walk away. Just make sure you get pedicures as chipped toe polish and cracked heels are a big no no. For example, leggings are always trendy and look great when worn well but thanks to my body type, unless I lose a few inches on my thighs, I look terrible in them. Fashion is expensive. Style is not. Some of the most stylish girls are certainly not the wealthiest and often girls with less money understand style the best. Maybe its because they consider their purchases more carefully and perfect the art of mixing expensive items with cheaper finds. Or maybe because they know where to splurge and where to save. But what is truly fantastic. Spend your money on one-of-a-kind, dramatic pieces. You know one when you see one. You fall in love with it immediately. You know you look good in it and everyone else knows you look good in it. You don't need to be perfectly put together all the time, as if you're going for a photoshoot. You do not need a perfectly matched style and should learn to break the rules. Have fun and let your hair down. If you're comfortable in what you're wearing, that's all that matters. When a woman embraces her “imperfections” they can become her greatest strengths, definers of her character and spirit. When she plays up her weakness and draws you to her flaws, she makes them special, attractive and even enviable. Note : This article is inspired and adapted by Nina Garcia's article in Elle magazine. I'll be absolutely honest with you and say that that font did hurt my eyes, it looks nice but it's a pain to read. Is there a font that has less curly bits on it that you could use? Hi June - Followed you here from IFB! Honestly, your blog is absolutely amazing! Everything you've said in this post of yours has so much of truth to it and is very in with the times we are in! I think I'm sorta hooked ;) Do keep up the awesome blog - Following you! This is really cute and SO true! I love this. You had me at basic 1. Haha! 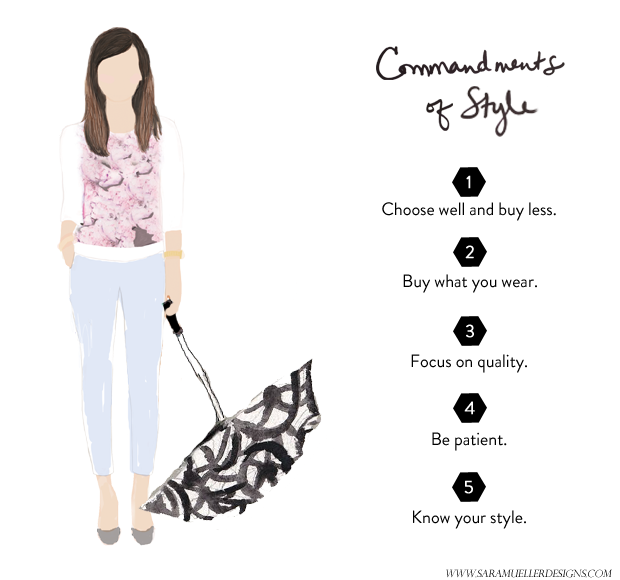 I had to agree with these commandments of style. I enjoyed reading your blog. You really know your stuff. I found your blog today and really love it. Following now dear. I hope you can visit and follow mine too. I agree with many points ! really love how informational your blog is ! I agree with so many of your tips and try to practice these rules in my every day life! The other thing I do is choose color palettes for myself. For instance, I like to purchase clothing in shades of blue, green, and red. I think they all look good on me but more importantly I think they are colors I can wear year round, making my wardrobe really multifunctional! Following you now, hope you can do the same! I agree with most of what is written on this post. Especially the part about projecting confidence, and being the fabulous broke that I am, I totally agree with what you wrote: "Fashion is expensive. Style is not." That's quite interesting, thanks for sharing this! It was great to read it & thanks for sharing your blog with me via IFB :) it's been a pleasure meeting you!! I definitely have quite a lot to learn from this, these could be quite helpful for me. Another excellent post hun, very useful!! These are such great pieces of advice- I agree with every single one! excellent tips honey! Especially the one about being creative. Thanks so much for following my blog, now following you back. Thank you for your post, there is s much truth to it and I loved your writing. love your header so much! Hey, thanks for your lovely comment.I follow you now with gfc. YOu have written it well. I think Confidence matters the most. Hey there! thanks for follow my blog! i hope you keep enjoy it and love all my posts. kisses! Great article! I love sharing things I find with everyone! Good choice! Really interesting and useful post. I agree about the bones of your closet. When I start earning money again I will be buying some plain tops :) I always miss them because I'm too busy staring at a sparkly fancy top! great post! I totally agree with a lot of these points.. Thanks for sharing these great tips and tricks! Congrats on making links a la mode! These are all amazing tips...thanks for sharing! 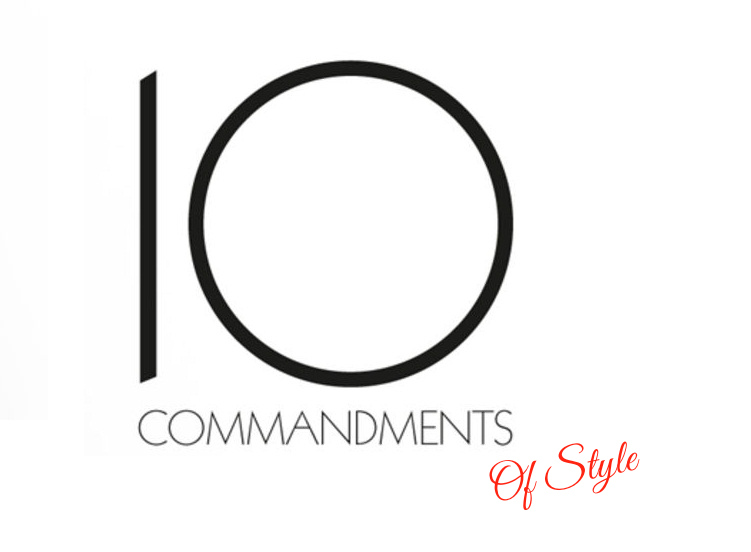 I love how you inculcated an element of stark reality in every commandment..very helpful!